The ruling All Progressives Congress (APC) in Nigeria has expressed displeasure with the outcome of the National Assembly leadership election, calling it Treachery. Contrary to the party’s choice of candidates in a mock election over the weekend, Mr Bukola Saraki emerged the Senate President while Mr Yakubu Dogara clinched the position of the Speaker of the House of Representatives. Both persons are members of the APC. After the result of the House of Representatives’ election was announced by the Clark of the House, the ruling party said the outcome of the elections of the two chambers was “totally unacceptable and the highest level of indiscipline and treachery”. The party had chosen Senator, Ahmed Lawan for the Senate President’s position and Honourable Femi Gbajabiamila, as the its candidate for the position of the Speaker. In a statement, the spokesman of the party, Mr Lai Mohammed, said: “Senator Bukola and Hon. Dogara are not the candidates of the APC and a majority of its National Assembly members-elect for the positions of Senate President and House Speaker. “The party duly met and conducted a straw poll and clear candidates emerged for the posts of Senate President, Deputy Senate President and Speaker of the House of Representatives, supported by a majority of all Senators-elect and members-elect of the House of Representatives. 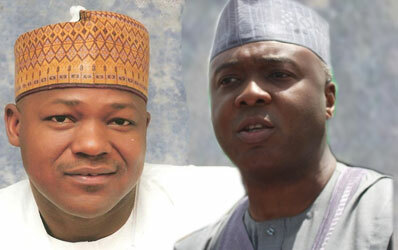 All National Assembly members-elect who emerged on the platform of the party are bound by that decision. ”The party is supreme and its interest is superior to that of its individual members”. According to Mr Mohammed, “the APC leadership is meeting in a bid to re-establish discipline in the party and to mete out the necessary sanctions to all those involved in what is nothing but a monumental act of indiscipline and betrayal to subject the party to ridicule and create obstacles for the new administration. “APC decried a situation in which some people, based on nothing but inordinate ambition and lack of discipline and loyalty, will enter into an unholy alliance with the very same people whom the party and indeed the entire country worked hard to replace and sell out the hard won victory of the Party. ”There can be no higher level of treachery, disloyalty and insincerity within any party,” the party said, vowing to resolve the matter using all constitutional and legal means available to it. Meanwhile, the APC has asked all its loyal Senators-elect to report to the Senate to be sworn-in in order to discharge their constitutional duties, apparently accepting the outcome of the election.